Baba Magher Singh was born in village Nagra, district Sangrur (Punjab). He joined Buddha Dal and was tutored by the legendary nihang jathedar (chief) Baba Santa Singh. Hero of the Rural Olympics of Kila Raipur, he has garnered a committed fan following since he started performing there in 1987. Horseback rider par excellence, he is equally proficient at wielding traditional weapons. Born in village Sangranwa, Gurdaspur on 8 August 1984 Baba Jasbir Singh received his education at Damdami Taksal Chowk Mehta. After graduation he joined the hallowed ranks of the Taksal as a Shastar Vidya ustad. Subsequently he was deputed to various assignments as an independent teacher. On 7 October 2010 he joined Sava Lakh Foundation. A gifted athlete and a wonderful teacher, Baba Jasbir Singh brings phenomenal experience to the Foundation. 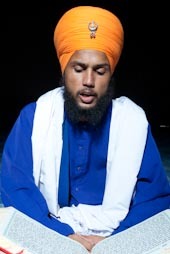 Baba Harnek Singh, from Ghanie ke Bangar, district Gurdaspur, trained at Damdami Taksal, Chowk Mehta. 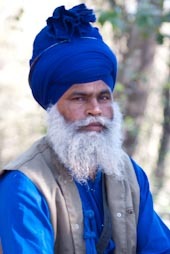 After acquiring knowledge of Sikh scriptures from Gyani Joginder Singh, he was assigned duty at Damdami Taksal's gurughar at Ram Thaman, near Khajala, district Gurdaspur. Three years went by under the tutelage of celebrated Kathavachak Gyani Pargat Singh. In 2006 Baba Harnek Singh was sent to village Chananwal, district Barnala. A true saint soldier, he has turned the place around. Men, women and children flock to the gurdwara to listen to his enlightening discourses, imbibe gurbani santhya and train in shastar vidya. Sava Lakh Foundation is honored to have Baba Harnek Singh join the panel of maestros. He guides the Foundation's sessions on gurbani santhya and actively participates in our shastar vidya classes and presentations all over Punjab. Born on 12 August 1986 he is the youngest maestro. Born in village Raipur, near Banga, on 2 September 1976 Baba Swarnjit Singh joined the Buddha Dal after his initial schooling. Baba Santa Singh sensed potential in him and encouraged him to explore, learn and spread awareness. 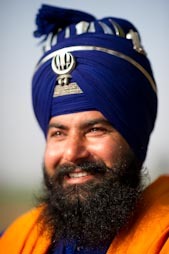 Tech savvy, he is a pioneer amongst Nihang Singhs in setting up facebook and flickr accounts. 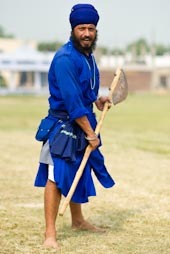 Possesses vast knowledge of the oral and documented tradition. Widely travelled in France, Germany, Italy, Belgium, Pakistan and India, he brings a sense of urgency to documenting and preserving our gorgeous heritage.